See this impressive collection of portraits of 27 major figures in British theatre and film. 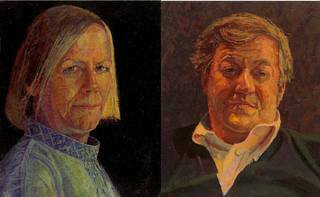 You'll spot some very familiar faces in this collection of portraits by artist Francis Hamel. His sitters have all held the position of the Cameron Mackintosh Chair of Contemporary Theatre at Oxford University. This prestigious visiting professorship has previously been held by actors, writers, directors, and producers including Arthur Miller, Ian Mckellen and now Deborah Warner. The post was founded to promote the interest, study and practice of contemporary theatre.